Philip Hammond told Surrey county council’s deputy leader he sympathised over funding difficulties, saying he would ‘take this up with Sajid Javid’ [Image: Carl Court/AP]. Apparently a government spokesperson has said the discussions with Surrey Council were nothing exceptional and repeated the claim that no deal was struck. If so, then where is the correspondence that says the Surrey MPs, including the Chancellor, were unable to convince the government to do anything to help? Where is the official, written confirmation that nothing underhand happened? And, now that I’ve mentioned it, can those letters be provided in a form in which the ink on the signatures isn’t still wet? Without such an assurance, I’m afraid Mrs May should still be brought back to Parliament to explain her lies. Philip Hammond was among a series of Conservative MPs who lobbied on behalf of Surrey county council in a row over social care funding, correspondence released under freedom of information laws has shown, reviving claims the council received a special deal from ministers. Hours after Theresa May insisted at prime minister’s questions that Surrey had enjoyed no preferential treatment, one of the released letters and emails showed the chancellor had spoken to the communities secretary, Sajid Javid, on the council’s behalf. 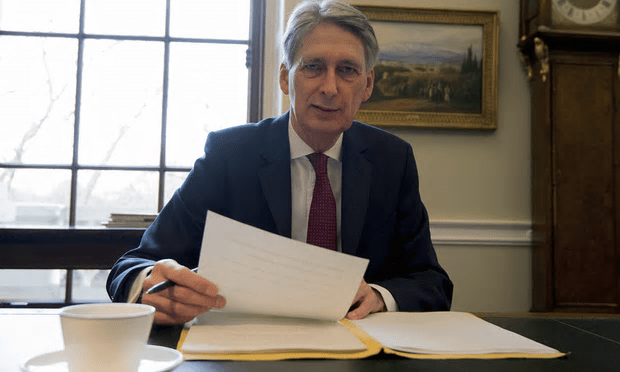 Hammond, who represents the Surrey constituency of Runnymede and Weybridge, wrote to the council’s deputy leader, Peter Martin, in September to sympathise about funding difficulties, saying he would “take this up with Sajid Javid”. The correspondence shows that another Surrey MP, Jonathan Lord, wrote to the council in November saying he had discussed the issue with Javid and “he’s doing something for us”. In an email to the council’s leader David Hodge and fellow Surrey Tory MPs in January, Lord suggested Javid might have “£40m hidden under the departmental sofa” for the council, and suggested other councils’ budgets could be trimmed to help. The new documents show a concerted lobbying effort by Surrey MPs, among them Hammond. Other Surrey MPs to lobby for the council included Chris Grayling, the transport secretary, Michael Gove, Crispin Blunt and Dominic Raab, the correspondence showed. Another lying, cheating Tory fraudster. Yes you can trust the Tories…..honest to the core. No lie will ever pass the lips of a Tory. It’s a pity Muffer T did not change into a lying toad after uttering her third lie in Parliament. Even if there was no deal, and the council was merely assured of what the budget would do for social care, it’s still massively corrupt for a Tory council to receive notice of this before everyone else. If the Tories were planning to address social care in their budget, then nothing stopped them from simply saying so above board, yet they’ve done it in secret meetings apparently with only a single council that was about to make them look bad. That said, as we’ve now found the social care funding boost is a joke; £3 billion sounds nice until you see it’s over four years, so it’s only £750 million/year, after around £5 billion/year in cuts has brought the system to its knees.